We all know that we unfortunately spend a large portion of our rehearsals focused on the woodwinds and brass, especially during the “warm-up” phase of the rehearsal. Those poor percussionists can at times feel unwanted and unloved while we have the band play long tones, warm-ups and scales. There are many pieces for band that don’t have a lot for them to do, and I remind composers all the time that bored percussionists in the back of the room is not a good thing for the teacher, as it can result in disciplinary problems. It is also not doing the best we can to teach these students as well as we do the other instrumentalists. I know that some directors are trying to overcome some of this through marching band and indoor drumline, but this still does not improve the percussionist’s experience in concert band. So, let’s focus on that. First of all, the percussionist should be just that – percussionists – and not just drummers! They must learn and have experience on all percussion instruments. They all should play timpani and mallet instruments along with snare drum and all of the accessory instruments, and they must learn how to play them correctly. I suggest that you make the percussionist play something along with every note during your warm-up routine. They can play the pitches on the mallet instruments and timpani and the rhythms on the drums. I suggest you have them play rudimental patterns too while you are playing warm-ups, scales and technical studies. If your warm-ups don’t have anything written out for the percussion, then write something out that will challenge these students, each and everyday, just like the wind players. It can be as simple as a different rudiment everyday, or an accent pattern, simple paradiddle patterns or rolls. And, it doesn’t have to be loud. It needs to be controlled and in balance, just like you want them to do during the music. Also, just like the wind players, emphasize proper technique and playing position. Don’t let them sit back there and play with the wrong grip, the drum too low or any other bad habits. If you expect good posture and embouchure from the winds, expect proper technique from the percussionists as well. Bands often play chorales as the last part of the warm-up process. Some things you can do with your percussionists are to have all four parts of the chorale played on different parts of the mallet instruments, so it will sound like a 4-part mallet ensemble, and yes, they need to read bass clef too. If the chorale does not have any percussion parts, write some. Chorales would be a great way to have them work on their technique for playing suspended cymbal, mark tree, triangle, rolls on bass drum, even crash cymbals on the climax of the chorale. Get creative and make this experience as close to what these students will encounter when playing their band music. During the rehearsal of the music, make sure to work with the percussion, too. Think about not just what they are playing, but how. Are they pulling the sound out of the instrument? Are they using the right mallets for the color of sound that is needed in the piece? Please don’t use brass mallets on bells just because that is what you have. Some more delicate bell parts require a softer mallet to get the appropriate sound. This goes for timpani as well. Does the piece require harder mallets for a more staccato sound on the timpani? These are important points that are often overlooked by many band directors. Let me ask you, how do your percussion instruments sound? When was the last time they were tuned, or had new heads put on? How about the timpani pedals? Do they work? You wouldn’t ask your clarinet players to play on broken instruments, so why do we do this with percussion? 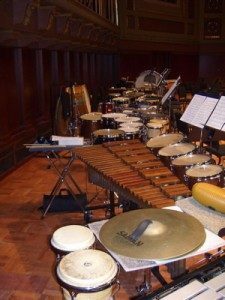 If the music you are playing for the next concert is a bit short on percussion parts, then why not program a percussion ensemble piece to add variety to the program? It is important for these members of your ensemble to be challenged and grow musically, too. It is just not fair to those students to make them constantly sit around and do nothing, because I can tell you from experience, the more you do this, the worse they will play the parts they do have, because they just won’t care! Yes, percussionists have to learn how to rest, and to wait for their time to play, but we can set up ways to engage them during concert band so that they feel more a part of what is going on, and also they can learn something and be challenged to improve. It takes creativity to be a band director, and I encourage you to place more focus on the back of the room, so that it is not the forgotten section of your ensemble. Good luck!